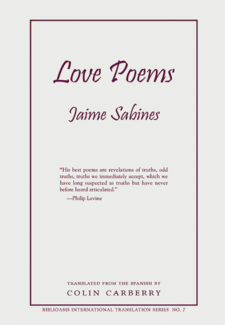 Jaime Sabines Gutierrez, Mexico’s most influential modern poet, was born in Chiapas in 1926. His first collection, Horal, appeared in 1950 and met with widespread critical acclaim. Several of his later titles are considered classics, and his poetry continues to be anthologized and widely translated. He received numerous literary awards and honours over the course of his career, including the City of Mexico Prize, the National Prize for Literature, and the Belisario Dominguez Medal of honour. Often regarded as one of the major poets of the 20th century, he died in Mexico City in March 1999.